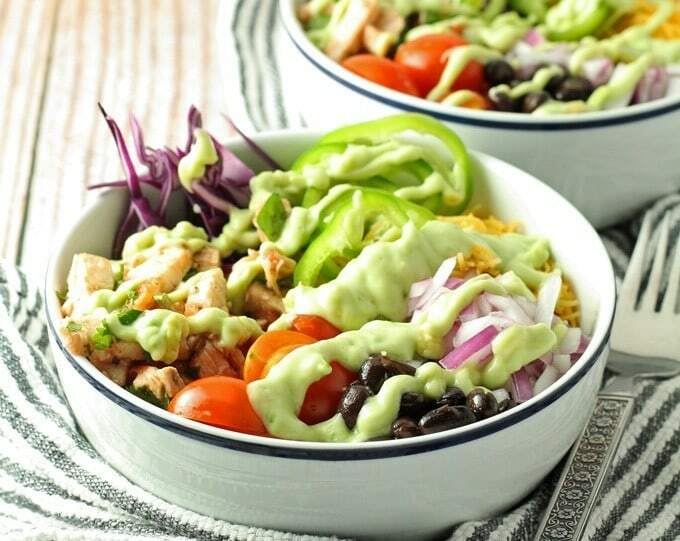 Leftover chicken burrito bowls topped with avocado crema. Full of veggies and flavor, they are the perfect use for leftover chicken! Leftover chicken can get really, really boring. Especially if you found it a little boring to begin with. Plain chicken is better for you but I often want to slather it in a healthy dose of buffalo sauce… a foodie girl can dream. When I see plain leftover chicken in the fridge, I cringe – there has to be a solution that isn’t terrible for you! Turns out there is. I found a solution that is going to make you very, very excited and happy. Cause what makes everyone happy? A burrito of course. It really does, I swear. And even better, a burrito bowl. This leftover chicken burrito bowl isn’t my first. I made loaded burrito bowls a few months ago and they are fantastic. It starts with… leftover chicken. Slice up whatever cooked chicken you have in the fridge. Put it in a sealable plastic bag or a small bowl and put in the marinade ingredients. Mix everything up and then stick it in the refrigerator for an hour. My recipe is for a large amount of chicken so increase or decrease accordingly. If your chicken is a little overcooked, this is going to help “hydrate” it. If it is bland, it’s going to season it. And if it was good to begin with, it’s just going to make it even better. While the chicken/marinade is chilling in the fridge, make your rice and start chopping up your vegetables. When you have about 10 minutes to go with your chilling chicken, mix up the avocado sauce so you’re ready to go. 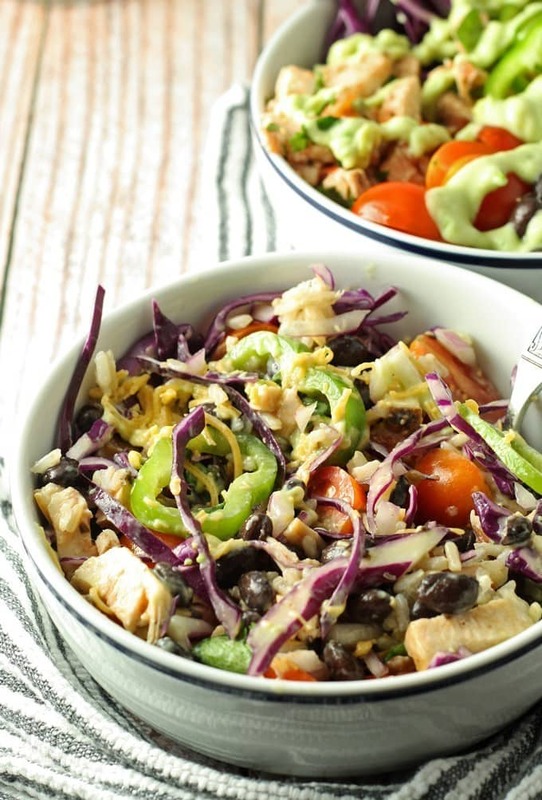 Assemble your burrito bowl and enjoy! In a small bowl, combine cooked chicken breasts, cilantro, lime juice and salsa. Stir well, cover and refrigerate for 1 hour. In a small bowl, smash 1 avocado with a fork until smooth. Add the yogurt and mix together with a whisk or a spoon until smooth and most of the lumps are gone. Refrigerate leftovers. In a microwavable bowl, heat the chicken and black beans in 30 second intervals until warm. 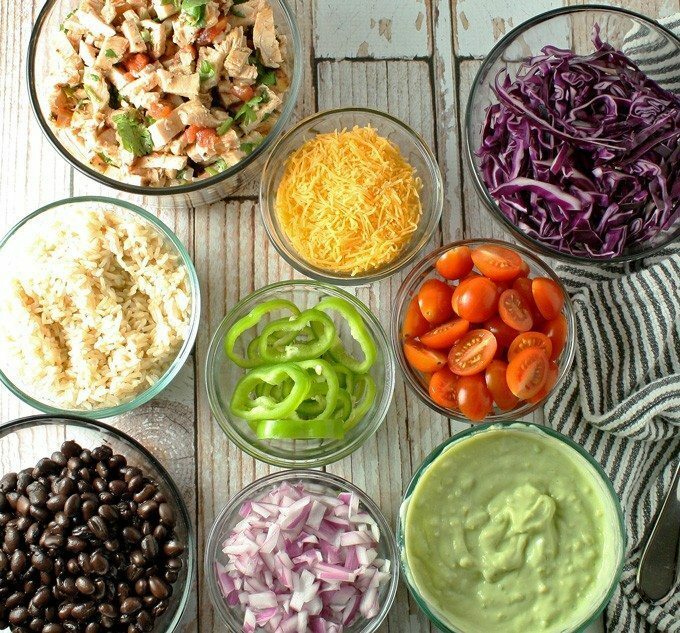 To assemble the burrito bowls, layer the bowl ingredients in a small bowl, starting with the rice, then chicken, black beans, red onion, tomato, pepper and onion. Drizzle avocado sauce on top, mix and eat. Looking for more fun recipes? Try this recipe for tacos or this recipe for quesadillas! I am always looking for creative ways to use up leftovers. Pinned! Jenny you had me at the marinade for the chicken, but that gif just seals the deal. What a great summer supper–I can see grilling a ton of chicken and using the leftovers with farm share produce in an easily customizable bowl that the whole family would get into. 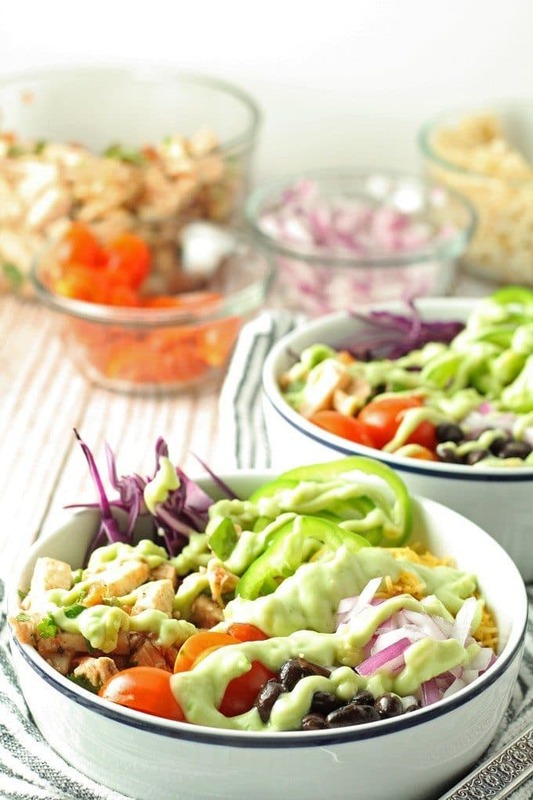 Thanks Kirsten – I can’t stop eating these burrito bowls! I just cooked up a bunch of chicken breast in the crockpot over the weekend and shredded it. This is a wonderful idea for me for lunch! Yum, I’m excited for you already! 🙂 Thanks Chrystal! Thank you Patty – its such a shame to just eat leftovers as they are when, with a little creativity, an entirely new meal can be made! Love this recipe – can’t wait to try. I’m a new follower – found you on Let’s Get Real Link Party. I’m always trying to come up with ways to use up our leftovers. 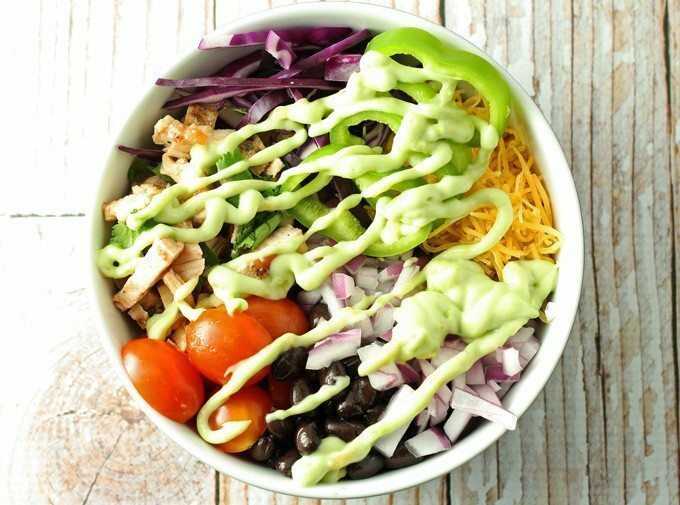 And that avocado dressing looks so yummy!! Just wanted to stop by to let you know I’ll be sharing your post on My Favorite Things weekend roundup tomorrow! Have a wonderful weekend! Awesome, thanks for letting me know Amanda! This looks colorful, nutritious and delicious! We are so glad you shared this yummy recipe with us at Merry Monday. We look forward to seeing your creativity again. Gosh this looks great, I know my boys would love it! pinned and hope to make this very soon. I actually love chicken – but you’re right, alone it lacks a little je-ne-sais-quoi. 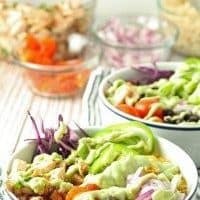 Creamy avocado dressing? I’m on board! Yum! This looks perfect for Summer. We used to go to Moe’s and Qdoba when we lived in the city all the time and I got something similar. Now that we live in the country, it’s much harder to get stuff like that. Excited to be able to make my own now! Especially with that avocado sauce. 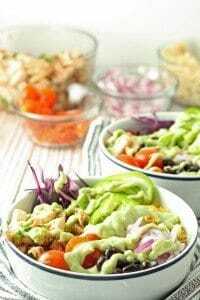 Oh my gosh – I love Qdoba! I haven’t been there in ages, guess I know where I’m getting lunch soon! When you make your own, don’t forget that you can use whichever toppings you have on hand. Really helps with more leftovers than just chicken! We are so going to make this! Love that it was specific to using leftover chicken, because don’t we all have leftover chicken in our fridge? This looks amazing! I totally have the same reaction when I see leftover chicken in the fridge and now I can make a great meal with it. Thanks for sharing on Merry Monday. Pinned. This looks really good! I always get chicken bowls from Chipotle and I LOVE them. I can’t wait to try these out w/ my family. 1 question tho, I’m assuming you used plain yogurt, so is the avocado cream sauce bland or do you add S&P to taste??? I didn’t add any salt and pepper but of course, both can be added to taste. Hope you like it!